Amos was God’s man giving God’s message. Simply because Israel was being religious on the surface did not guarantee that God would not judge their sin. Because of their rejection of His law—their deceit and robbery and violence and oppression of the poor—God said, “I hate, I despise your feast days…. Though ye offer me burnt offerings and your meat offerings, I will not accept them…. Take thou away from me the noise of thy songs…. 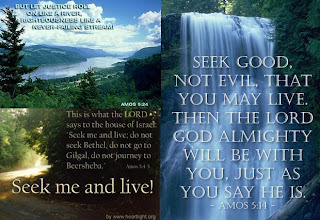 But let judgment run down as waters, and righteousness as a mighty stream” (Amos 5:21–24). Amos can see that beneath Israel’s external prosperity and power, internally the nation is corrupt to the core. The sins for which Amos chastens the people are extensive: neglect of God’s Word, idolatry, pagan worship, greed, corrupted leadership and oppression of the poor. Amos begins by pronouncing a judgment upon all the surrounding nations, then upon his own nation of Judah, and finally the harshest judgment is given to Israel. His visions from God reveal the same emphatic message: judgment is near. The book ends with God’s promise to Amos of future restoration of the remnant. 1. Judgments on the cities surrounding Palestine, Amos 1:1 - 2:3. 2. Judgments on Judah and Israel, Amos 2:4-16. 3. Jehovah’s controversy with “the whole family” of Jacob, Amos 3:1 - 9:10. 4. The future glory of the Davidic kingdom, Amos 9:11-15. (1.) The nations around are summoned to judgment because of their sins (Amos 1:1-2:3). He quotes Joel 3:16. (2.) The spiritual condition of Judah, and especially of Israel, is described (Amos 2:4-6:14). (3.) In Amos 7:1-9:10 are recorded five prophetic visions. (a) The first two (Amos 7:1-6) refer to judgments against the guilty people. (b) The next two (Amos 7:7-9; Amos 8:1-3) point out the ripeness of the people for the threatened judgements. Amos 7:10-17 consists of a conversation between the prophet and the priest of Bethel. (c) The fifth describes the overthrow and ruin of Israel (Amos 9:1-10); to which is added the promise of the restoration of the kingdom and its final glory in the Messiah’s kingdom. Notes: (1) This ministry does not necessarily endorse or share all the views and opinions expressed in the materials, resources or links mentioned in these posts. Please always refer to the Articles of Faith and Biblical distinctives of Baptists when you study these materials. (2) This lesson is part of the projected 300 plus lessons. From time to time, the lessons will be updated, revised, combined, formatted, and edited to comply with the VOA Simplified English word list. Later on, these lessons will be categorized, numbered sequentially, and made available as PDF downloads. (3) “A plumb bob or a plummet is a weight, usually with a pointed tip on the bottom, that is suspended from a string and used as a vertical reference line, or plumb-line. The instrument has been used since the time of the ancient Egyptians by bricklayers, masons, and carpenters to ensure that their constructions are “plumb”, or perfectly upright. It may also be used in surveying to sight a point on the ground that is not readily visible.” (Wikipedia). The two-minute video below shows, at the 1:32 mark, how a plumb bob or plumbline is used.